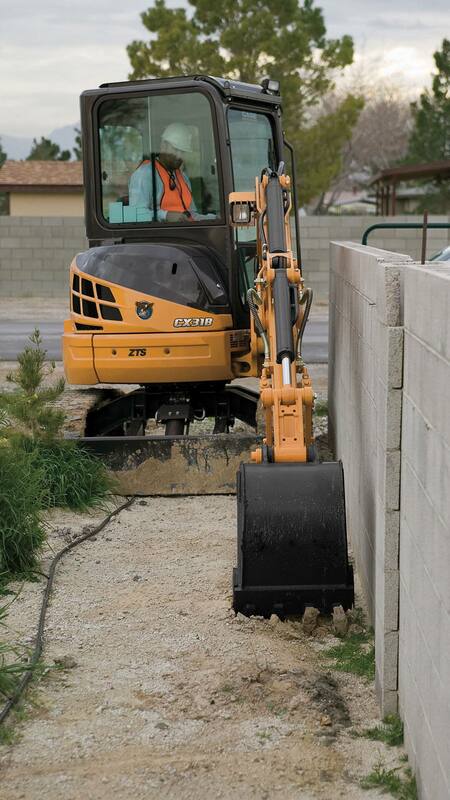 The CASE CX31B features a heavy duty undercarriage with heavy plate guards that prevent damage to hydraulic motors, making it an excellent addition to any utility or landscape fleet. The optional angle blade decreases the time required to backfill a trench while options such as thumbs and augers increase the machine’s productivity, maneuverability, and performance. Ground level fluid checks make daily maintenance quick and easy, resulting in maximized uptime. The centrally-pivoted boom allows for an accurate excavation, close to a fixed object. 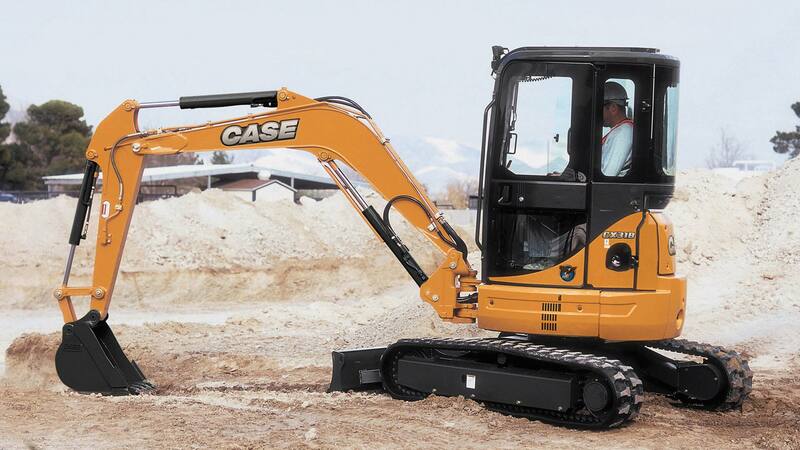 A hydrostatic drive system and joystick control make mini excavators easy to be operated. The auxiliary hydraulic system allows using several accessories, such as hydraulic hammer, drill and claw. Parallel, unobstructed operation near obstacles, tree lines, and foundations can be done with the zero tail swing design and independent center swing boom. Rapid machine positioning and simultaneous moves of the swing boom and house are accomplished via the foot pedal swing-boom control. Machine stability and backfilling are provided by the hydraulically-controlled backfill blade. For quicker backfilling of trenches an optional angle blade is available. Surface damage is kept to a minimum due to the standard, durable rubber tracks while optional steel tracks provide even greater protection. The Yanmar engine is powered to match the performance of the CX31B. This engine meets the current Tier 4 Interim environmental standards and while consuming less fuel. 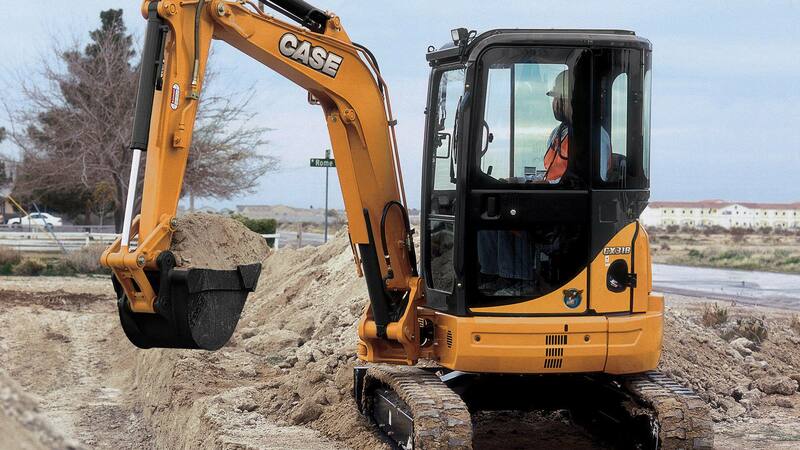 The CASE Compact Excavators also feature a one touch deceleration to minimize fuel usage while not in operation. Finally, the integrated-flow pump system (IFPS) efficiently manages the pump flow during operation to maximize the use of engine power and increase the fuel efficiency. The three post canopy provides exceptional visibility to all areas while operating the CX31B. For operators working in inclement weather, an available enclosed cab with heat or with heat and air conditioning are available options. Responsive performance and low fatigue are delivered through the smooth, intuitive pilot controls. A standard pattern selector allows operators to choose their control pattern preference for optimum productivity. Get service and diagnostics done quick and easy with a one-piece, swing-out side access panel. Grouped hydraulics and rear engine access provide the ability to do daily checks in no time at all. Operator’s controls: pilot operated hand controls and foot pedals. Display includes: engine oil pressure, water temperature lamp, air filter lamp, water separator detection lamp, low fuel warning lamp, battery charge lamp, glow plug indicator lamp, water temperature gauge, fuel gauge and hourmeter. Adjustable seat with seat belt. Engine access under rear hood. Dry type air cleaner with restriction indicator. Auxiliary hydraulics (single/bi-directional) and plumbing to arm. Sealed and lubricated track rollers. Track tension adjustment (grease type). Disc type parking brake (auto release and apply). Swing boom (70° left/60° right). Hydraulic backfill blade. ROPS/FOPS closed cabin with heater and air conditioning. Steel tracks, Arm with 5’4” (1.62m). Additional hydraulic line for swing. 5’ 4” (1.62m) Arm, Additional counterweight.